After graduating from Wilson College in Chambersburg, Pennsylvania in 1958 she married Paul Neal and for the next 16 years lived, worked and studied in Puerto Rico, Brazil, Portugal, and Argentina. Currently Irene and her husband enjoy living in the waterfront community of Merritt Island, Florida where her studio is located. Living in Florida along Sykes Creek gives me a never ending realm of luminous formations of clouds, sparkling water, and fantastically beautiful birds , just to mention a few catalysts to spark my imagination. I paint my large free form acrylic and gel paintings on the floor as Pollock did... using canvas as a base or Lexan plastic , and at times found objects. And that is what I hope will be the response of those who see my work ! Donald Kuspit has written of my work, " Clement Greenberg (who actually critiqued my work at Anthony Caro's Triangle workshop back in 1985) would probably classify Neal's work with that of Van Gogh and Soutine." Kuspit concludes, "Neal has found a way of extending modernist painting by extending the sense of the feelings it can expose." 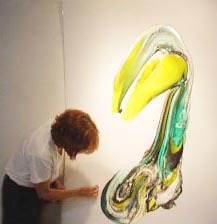 Irene Neal has exhibited her works on an International level at numerous museums and galleries some locations include: New York City, Paris, Canada, Brazil, and at the Czech National Gallery in Prague. 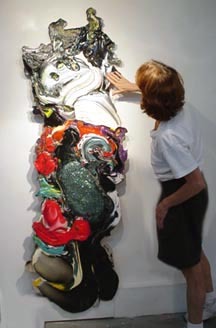 "She works in a tradition of large size freeform abstraction, originating with Jackson Pollock, the Abstract Expressionists, and the Color Field Painters. She reinterprets this tradition by means of a new, state -of the-art, acrylic paints and gels, which have undergone an extraordinary development in recent years. In these free form abstract paintings, Irene Neal aspires to the brillant accident, the miraculous frozen moment in the flow of paint. Working experimentally with new materials, she has had to improvise fer own unique "craft:" ways of organizing herself to paint; mixing and applying colors so as to keep them clear and vibrant....whether on canvas, wood, plastic or paper, Neal shows herself to be a master painter." "Irene Neal favors amorphous formats that resemble liquid drops, often creating a sheen like that of semi-precious stones..."